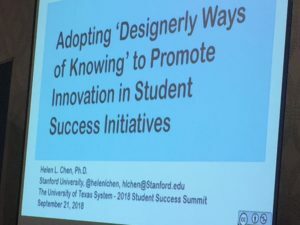 Here are my notes and thoughts about from the The University of Texas System: 2018 Student Success Summit. The focus is on “The Faculty Role in Student Success”. *Key consideration to think of beyond the conference: what can faculty do to support student success? What can institutions do? Keynote: Complicated Relations: Supporting Student Success in an Increasingly Complex Landscape. Dr. Natasha Jankowski, National Institute for Learning Outcomes Assessment. Most importantly, I became aware of this organization, National Institute for Learning Outcomes. Note to self: check their site for resources and follow them on social media. Make explicit marketable skills to students. This is a valuable idea to connected student learning to how it will benefit them in the marketplace. I often do this by pointing out to students the “why” of what they need to know in regards to their future profession (in my case, K-12 teachers), as well as creating a “Career Tips” section in my Blackboard shell where I connect learning to increasing marketability. High-impact practices. My thought: what are these with online learning, in particular? Book recommendation: Degrees that Matter: Moving Higher Education to a Learning Systems Paradigm by Natasha A. Jankowski and David W. Marshall. An idea that really resonated with me is when Dr. Janowski talked about supporting students by annotating examples of quality work and thinking aloud about it. I had two connections to this: to explore the digital annotation tool Hypothesis (which my colleague Ian O’Byrne uses extensively) and to also continue to produce screencasts where I analyze what constitutes good work. This sounds like explicit thinking and modeling to me, a tenet of good learning. Transparency–need to be transparent with students. Role of self-assessment for students. Have students use rubrics to self-assess their work and then identify how they are going to improve their work. Make explicit about courses work together (e.g., courses in a program) and how they build on one another. Make this explicit. I went to a session on action research, Action Research as a Data-Driven Tool for Improving Instruction and Student Success, by Emily Bonner of UT San Antonio. She broke down the process nicely. A colleague, Kim Breur and myself shared about how we engage with action research in our Professional Learning Community at The University of Texas at Arlington and how we work separately on our respective inquiry while also searching for answers to a common shared topic. She identified this as “parallel inquiry”. That was a new concept for me and one we can take back to our PLC at UTA. I presented with two colleagues from UT Tyler and UT El Paso on “Designing and Delivering Online Classes for Student Engagement and Learning”. We focused in on using social media to engage students. 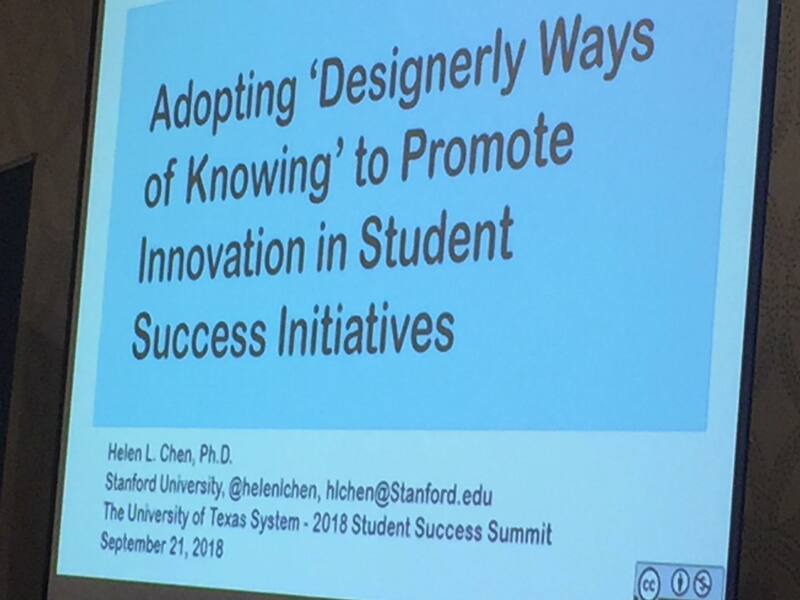 Day 2: Adopting ‘Designerly Ways of Knowing’ to Promote Innovation in Student Success Initiatives. Dr. Helen Chen (Stanford University) and Design Thinking. Check out Lisa Grocott’s website.